Take advantage of the new Connecticut tax credit for solar panels. Find out exactly how much solar will save you, including tax and financial incentives that Connecticut residents can qualify for. More Connecticotians than ever are choosing to invest in solar systems to power their homes. The recent uptick in solar installations is hardly a surprise, given the high cost of electricity in Connecticut and excellent incentives that allow homeowners to install a solar system with minimal upfront cost. In 2017, Connecticut households spent an average of $139.97 per month on electricity. Energy costs in Connecticut are higher than the rest of New England and amongst the highest in the United States. Electricity prices are not expected to improve either. Industry experts are warning residents of Connecticut to prepare for sharp increases in energy costs in the next decade. In a plan to offset the rising cost of electricity, Connecticut lawmakers have created a number of incentives to help homeowners control their energy costs by going solar. Solar panels aren’t just for the wealthy either – there are several options available that allow you to get solar panels installed on your home for $0 out of pocket. At Momentum Solar, we are here to help you navigate these incentives and make your transition to renewable solar energy as simple as possible. For the average household, solar panel systems hold an appeal that extends beyond just cost savings. After all, it’s pretty exciting to think about generating the energy you need to power your home right from your home. Unlike other forms of renewable energy, there are no moving parts, making the systems completely silent. Modern installations allows for solar systems to be installed discretely, without being an eyesore. Most of us are now familiar with the sight of solar panels installed atop of homes and businesses. What happens inside of these panels? It’s remarkably simple, actually! The technical term for these panels is “photovoltaic panels” or PV panels for short. When sun hits PV panels, the cells on the panels convert the light into DC electricity. Household appliances cannot use DC energy, so it must be converted to AC electricity before it can be used. That’s why all residential solar panel systems contain an inverter. DC energy flows into the inverter, where it converted into AC electricity. A meter measures the amount of AC electricity as it enters your home’s consumer unit. Your solar system will use all of the free electricity generated by your system until it is consumed. If you need more that what you generated, you’ll switch back to the electric grid. If you generate more energy than you need in a day, the surplus will be exported to the grid and you’ll receive credits for your surplus. The high costs of energy in Connecticut means that investing in a solar system can really pay off. In states where energy costs are lower, homeowners may not reap the benefits of the upfront investment. In fact, Connecticut was the second state to achieve grid parity in the United States. This means that the cost of energy from a renewable source, such as solar, is less than or equal to the cost of using the electric grid. At the end of the day, there is no denying that solar systems are a considerable financial investment. While we are eager to reduce our carbon footprint, it’s not going to happen unless it makes sound financial sense. Let’s look at 25-year example. Based on the rates referenced above for 2017, the average family in CT will spend just under $42,000 on electricity over 25 years if the cost of electricity does not increase. 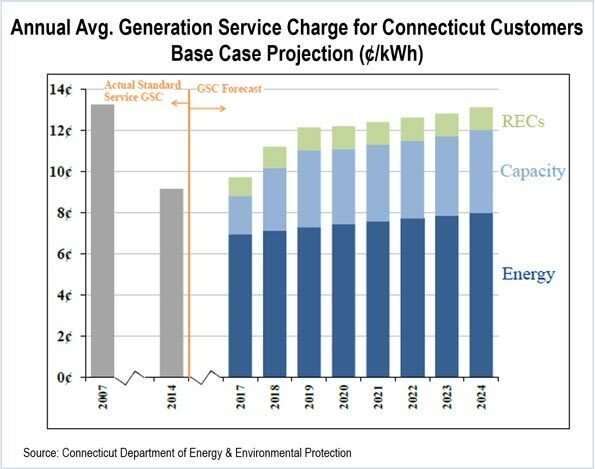 We already know that the cost of power in Connecticut is guaranteed to increase, but let’s use $42,000 as a reference point for now. Currently, a typical residential solar system costs between $12,000 and $25,000. For households with an average energy bill of $139.97, the system will pay for itself within 10 to 15 years. Think about your monthly electric bill – is it higher or lower than $139.97? Will your needs increase over the years? Do you believe that electricity will only continue to get more expensive as we do? Most industry experts state that solar systems in Connecticut will pay for themselves in less than 10 years if you take the rising cost of power into consideration. Still, the upfront costs can be daunting, but fortunately a number of incentives and tax rebates have been created to make solar panel systems affordable for the average homeowners. If you aren’t able to pay for your panels outright or through a loan, we also offer leasing and solar PPA (purchase power agreement) options to our customers. Through these programs, you will lower your electricity bill from day 1 without the need for an upfront cash investment. With a lease or PPA, you can start enjoying the benefits of solar for $0 down, locking in your savings for as long as you wish. Savvy homeowners are turning to solar as a way to minimize their environmental footprint, while also insuring that they can afford to power their homes for years to come. It is difficult to plan adequately for the future as energy prices continue to rise. These fluctuations make it impossible for homeowners to accurately budget for their needs and may some people may find it difficult to plan for retirement as a result. Solar energy is a wise investment in this regard because you are essentially locking in your energy costs for life. Now, knowing that you’ll spend on energy, you can budget more carefully for your future. The State of Connecticut knows that renewable energy is the right choice for the future, so lawmakers have created a number of incentives to motivate residents to invest in solar energy systems. Depending on your eligibility, you may be able to get a solar system installed in your home with no upfront cost. In 2011, the Connecticut Generally Assembly established The Connecticut Green Bank, the first “green bank” in the United States. A green bank is a financial entity that supports the development of clean energy by allowing private capital to be invested in renewable energy projects. While other states rely solely on limited government funding, the creation of a green bank means that CT residents have direct access to a larger amount of capital to invest in clean energy for their homes and businesses. The existence of the Green Bank has reaped huge rewards for Connecticut residents, ensuring that households are rewarded for the decision to use the sun to power their homes. In addition to funds from the Green Bank, Connecticut also offers a number of tax exemptions, and funding at the Federal level is still available. Some of the most popular incentives currently available are outlined in the table below. Residential Solar Investment Program (RSIP) RSIP offers an immediate rebate on residential systems based on the Expected Performance-Based Buydown (EPBB) of the system. The incentive typically ranges from $2,500 – $5,500 and is paid directly to your solar power contractor, allowing you to install solar with no upfront costs. PosiGen Solar + Efficiency for Low-to-Moderate Income Homeowners This initiative is designed to help low-to-moderate income homeowners get solar installed in their properties. It’s also perfect for anyone who is concerned that their credit score may impact their ability to get a Smart-E Loan. Smart-E Loan Another initiative of the Green Bank, Smart-E Loans let you purchase your system with no money down, low-interest rates, and flexible terms. These loans can be used to install solar and/or to make any other improvements to your property that will lower your energy consumption overall. Sales Tax Exemptions Homeowners do not have to pay sales tax on their solar power systems. Property Tax Exemptions The addition of a solar panel system to your home will increase its overall value. This property tax exemptions means you won’t need to pay higher tax rates due to your investment in a solar system. Federal Solar Tax Credit (ITC) In addition to the initiatives offered at the state level, you may also be eligible for a 30% reduction when you purchase your solar system outright. RSIP offers an immediate rebate on residential systems based on the Expected Performance-Based Buydown (EPBB) of the system. The incentive typically ranges from $2,500 – $5,500 and is paid directly to your solar power contractor, allowing you to install solar with no upfront costs. This initiative is designed to help low-to-moderate income homeowners get solar installed in their properties. It’s also perfect for anyone who is concerned that their credit score may impact their ability to get a Smart-E Loan. Another initiative of the Green Bank, Smart-E Loans let you purchase your system with no money down, low-interest rates, and flexible terms. These loans can be used to install solar and/or to make any other improvements to your property that will lower your energy consumption overall. Homeowners do not have to pay sales tax on their solar power systems. The addition of a solar panel system to your home will increase its overall value. This property tax exemptions means you won’t need to pay higher tax rates due to your investment in a solar system. In addition to the initiatives offered at the state level, you may also be eligible for a 30% reduction when you purchase your solar system outright. Another option available to Connecticut residents is leasing a solar PV system. This allows homeowners to get a system installed for little to no cost upfront. Residents may avail of the Performance-Based Incentive (PBI), which is used to pay the third-party owner of the solar system. The homeowner enters a contract directly with an Eligible Third-Party PV System Owner. The PBI will be paid out based on the actual performance of the PV system over six years. Have we got your attention yet? If you live in Connecticut, investing in solar has never been easier or more affordable. At Momentum Solar, our solar installers are here to help you navigate the ever-changing incentives. You don’t need to spend time understanding what incentives you are eligible fore – our experienced sales team understands the local incentives offered to residents of Connecticut and can help you pick the solar panel system that is right for your home. Now is the time to act. Give us a call to learn more about the process of installing a solar panel system in your home. Whether you plan to purchase your panels or want to take advantage of our $0 down options, we will design a system – and price – that perfectly suits your needs. Take control of your future while doing good for the environment – it’s a win-win situation.